The Army staff sergeant who lost all of his limbs in Afghanistan personifies resilience, determination and faith. Travis Mills feared the worst when his family visited him in 2012. 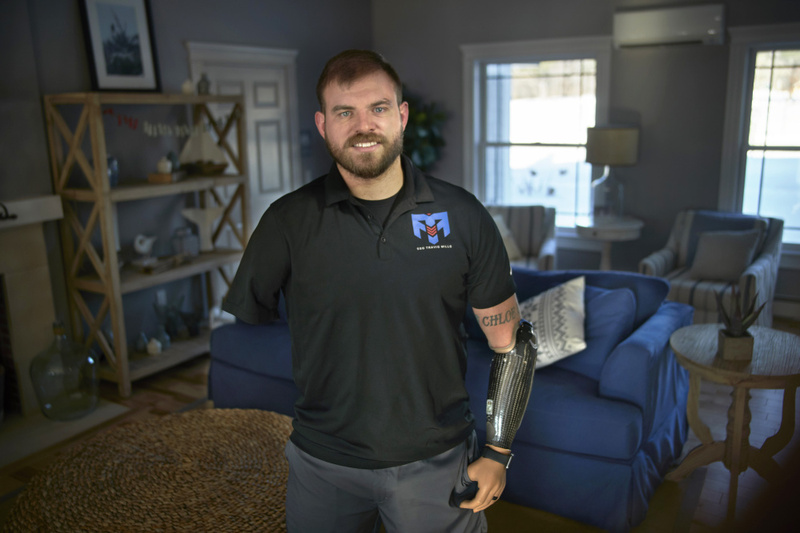 The Army staff sergeant was lying in a hospital bed, connected to a bundle of medical devices, after losing all his limbs following a landmine explosion in Afghanistan. In ways big and small, that familial devotion has stuck with Mills. The 30-year-old vet now lives in the Augusta area, where Kelsey is from. With prosthetics and other help, he has regained the ability to walk, drive a truck and perform countless other tasks that most of us take for granted. “My recovery was really driven by my daughter and my wife being there for me,” Mills says. His story has captivated many, becoming a best-selling memoir and the subject of a forthcoming feature film. It also has given the quadruple amputee, who works as a motivational speaker, a megaphone to help other injured veterans. This year, after raising more than $2.5 million, his foundation opened a retreat for wounded veterans and their families in the Belgrade Lakes Region. In its first season, more than 80 families came to the pastoral compound to relax, recreate and bond with one another. Going forward, Mills hopes to bring an older generation of veterans to the retreat and partner with other veterans groups to ensure the facility is put to best use. Mills doesn’t take a paycheck from his organization, but given his resilience, humility and gift for dry humor – he calls his jokes “disarming” – it’s no wonder that donors have gravitated to his cause. In its first year, the veterans retreat did experience some challenges. There was insufficient storage for the loads of diapers that came with young families. Activities like kayaking weren’t suitable when temperatures dipped. But just as Mills has been doing for years, the foundation came up with solutions, adding extra shelves and finding seasonally appropriate activities.